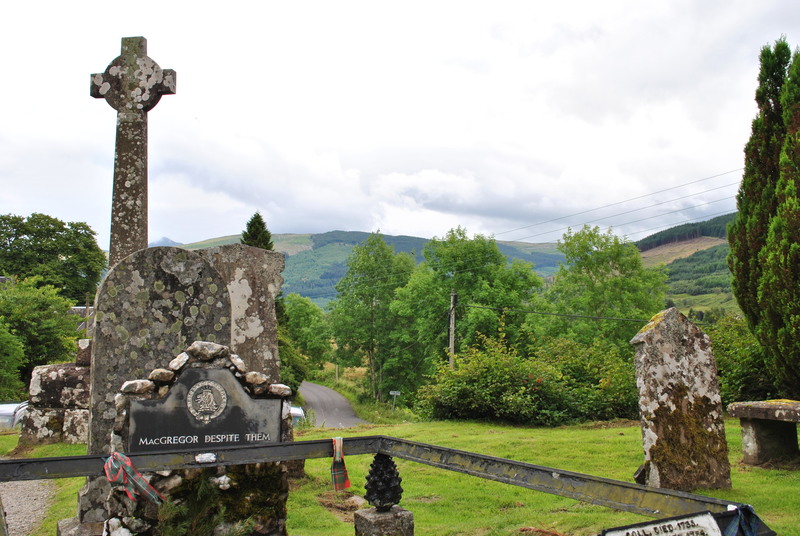 The story of Rob Roy MacGregor is well known in Scotland, it is part of the old lore, history and childhood. A man who had joined the Jacobite Rising at the age of 18 and was badly wounded in the battle of Glen Shiel 1719. He was a fighter and a cattleman, selling rich Lowlanders protection against cattle rustling, i.e. thieving and gave the so earned money to his poor people. He rustled up a deal with the Duke of Montrose and borrowed money to buy and sell Highland cattle. But one of his men disappeared with cattle and money alike and MacGregor couldn’t pay his debt. Outlawed and evicted from his home in Inversnaid for defaulting on his loan, he lost everything to the Duke of Montrose but fought to get it back. The rest of the world remembers mostly the blockbuster with Liam Neeson, an Irish actor playing the part of the Scottish folk hero. 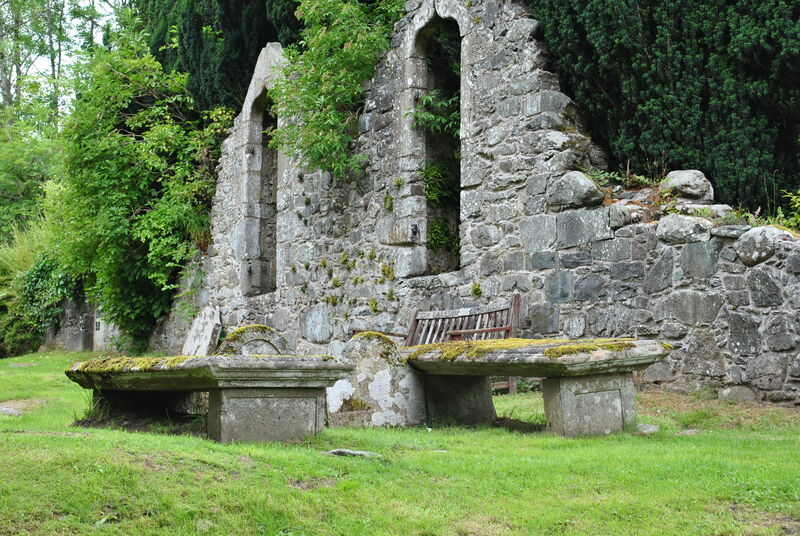 The Balquhidder Kirk, built in 1631 by David Murray, Lord Scone, lies in ruin. It stands on even older grounds of worship; there had been a Catholic chapel here before the Reformation. The first church on the site was built in the 12th century. 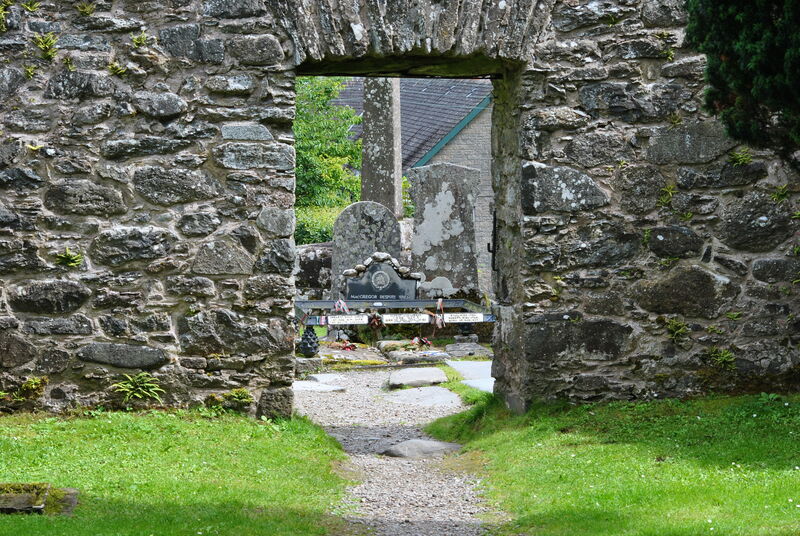 The MacLaren chiefs are buried here, within the ruined walls of the old kirk. Around 1500, the MacGregors moved in after the Campells drove them out of Argyll. Rob Roy, spend the rest of his life in this Glen and died December 28th 1734, killed in a duel. But was he also buried there? 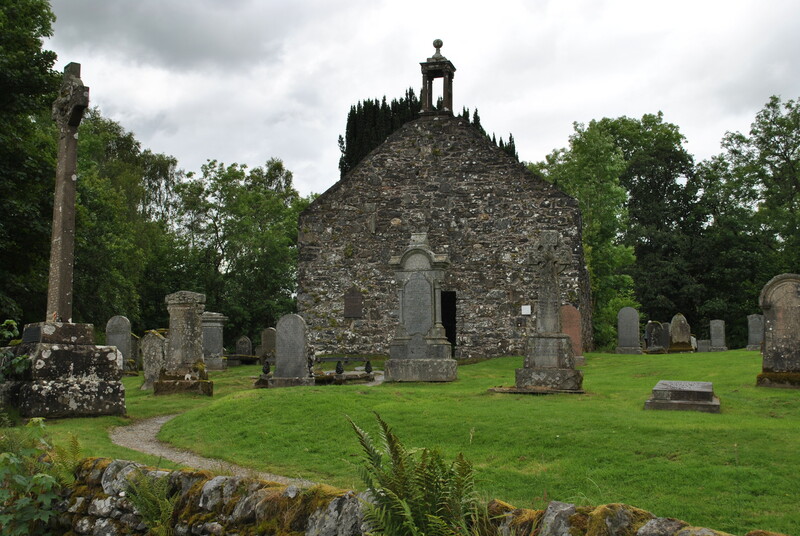 Early records mention a burial on New Year’s Day in Balquhidder but nothing can be found in the Parish register. The newspaper reported his death but not his funeral. The heavy stone slab that covers the alleged grave is much older. Local legend has it, that the corpse of Rob Roy MacGregor, the notorious clan chief, was carried along the Bealach nan Corp, the local coffin path, over a pass down to Loch Lomond, where the MacGregors buried their dead on the island Inish Caileach. 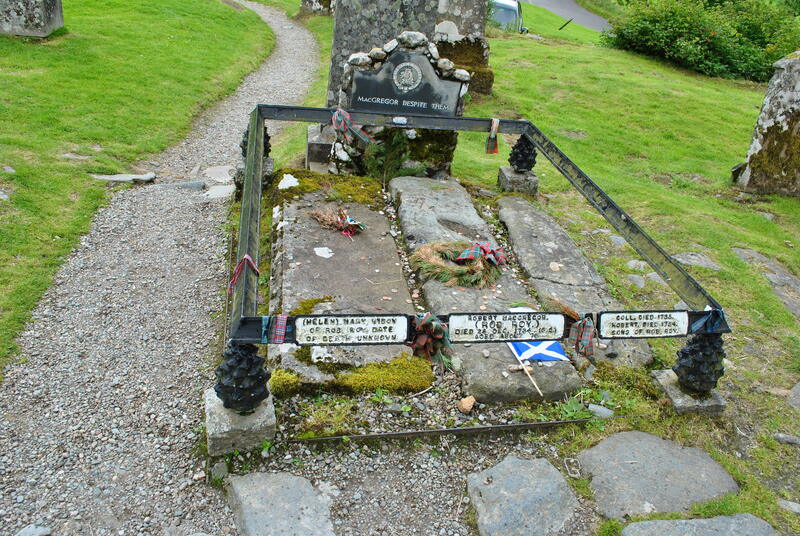 Maybe this is his true grave, in Balquhidder graveyard, maybe not. 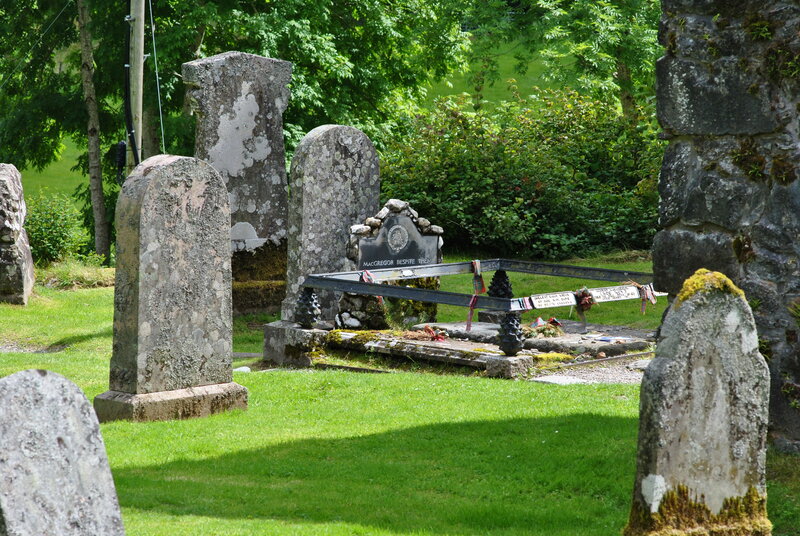 The grave remains as mysterious as the true man of behind the legend of Rob Roy MacGregor.